Home > Arts & Entertainment > A Great Big Disappointment? Plain White T’s opening for A Great Big World as this years spring concert. Is this another disappointing concert for Merrimack? Most of us will agree that Spring Weekend is the most anticipated weekend of not only spring semester, but of the entire year. As the Spring Concert takes place the Friday of spring weekend, it is expected that the weekend of festivities should start off with a bang. 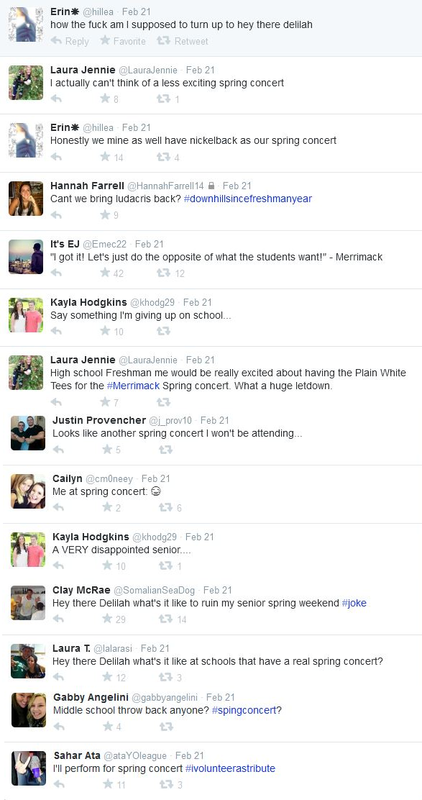 For the past couple of years, Merrimack seemed to disappoint their student body with spring concerts that fell bellow the bar. The under-the- radar team Girl Talk and well known, but mellow group, The Band Perry seemed to do everything but get the campus excited for their weekend ahead. On Friday, February 21, the big reveal for this spring’s concert was made following the men’s hockey game against the University of Vermont. Twitter feeds were flooding with the latest announcement, but by the looks of it, it seems it is another disappointing call by Merrimack. The band A Great Big World has recently hit radio stations with their song Say Something, featuring Christina Aguilera. But aside from that hit, are there any songs that people actually know of? The singers of Hey There Delilah, released their album All That We Needed in 2005, and it wasn’t until a few years later until the song actually became a hit. Now, nearly 10 years later the band is resurfacing before our very eyes, here at Merrimack.. This concert may be a blast from the past, but it seems that, as a whole, Merrimack students are a bit more pleased having this be a band that we all knew and loved at one point in our youth.